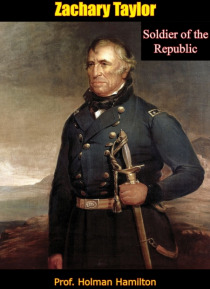 Until the publication of this first volume in 1941, Zachary Taylor (1784-1850), the 12th President of the United States, was strangely overlooked by modern-day biographers. Fortunately, journalist and newspaper editor Holman Hamilton has ably rectified this situation, and filled a large gap in the biographical record of American presidential history with this stirring account of the life and times… of "e;Old Rough and Ready. "e;Zachary Taylor: Soldier of the Republic is the first volume of Hamilton's two-volume biography. It covers the entire span of Taylor's military career from his earliest service in Indian warfare on the fringe of the frontier, to his great triumphs on bloodstained Mexican battlefields.Here is the story of 40 years of preparation for the brief period of glory in which Taylor was elevated to fame as 12th President of the United States: his presidency lasted a mere 16 months. Here too, for the first time, is the true romantic story of the courtship and marriage of Taylor's daughter and Jefferson Davis. All is set in a framework of American life on the advancing western frontier from 1820 to 1845.In preparation for this work, Holman Hamilton undertook extensive research, exploring many untapped resources, including unpublished manuscripts, rare volumes of western travel, original newspaper accounts, and many obscure records from the archives of the Library of Congress and the War Department. He also researched many of the Taylor family's personal papers, letters and memories. Finally, in the true tradition of investigative journalism, Hamilton personally traveled Taylor's "e;trail,"e; and visited every Taylor battleground-from Indiana to Florida, Wisconsin to Mexico-to give this biography an authenticity unmatched in detail or color.